The run up to Lent is the traditional time to sort out the larder and use up the ingredients you wouldn’t be allowed to eat until Easter. Well, you know me and tradition. Nowadays, it is the time to ditch all those out-of-date spices, herbs, dried fruit etc. This year, during my rummaging in the larder, I came across half a Kilner jar of my home-made mincemeat left over from Christmas festivities. In the past I have made a large plated mince pie and popped it in the freezer for that emergency dessert when people drop in. But I fancied a change. Over the years, I have amassed a large file of recipes that I think might be appreciated by the family. 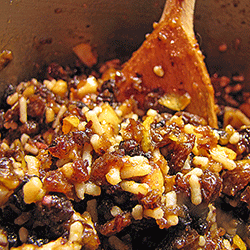 Amongst the recipes were a few fruit-cake that used mincemeat. I particularly like this one as it is so quick to make and, if you don’t mind the fruit getting chopped up, you can bung it in the food processor and just give the ingredients a quick blast. As this recipe has reached you during Lent, if you do have some mincemeat lurking in the cupboard, you may want to wait until Easter and use it as the basis for your Simnel Cake. Grease the cake tin and line the bottom with baking parchment. Mix all the ingredients in a large bowl until thoroughly blended. Turned the mixture into you prepared cake tin and smooth gently. Place on centre shelf of oven and bake for 1hr-1¼ hours or until the cake is golden brown and a skewer comes out dry from the centre of the cake. Leave in the tin for 20 mins and then turn out onto a cooling rack. This cake freezes well (up to 2 months - but not with marzipan in), so if you have some community events coming up who would welcome a donation this would do nicely.